April 21, 2015, KLEINBURG ON — The McMichael Canadian Art Collection announces its major summer exhibition, 7: Professional Native Indian Artists Inc. which will open on May 9, 2015. Organized by the MacKenzie Art Gallery and curated by Michelle LaVallee, MacKenzie’s Associate Curator, this exhibition is an unparalleled opportunity to engage with one of Canada’s most important early artist alliances. Gathering informally in the early 1970s, Norval Morrisseau, Daphne Odjig, Jackson Beardy, Eddy Cobiness, Alex Janvier, Carl Ray, and Joseph Sanchez formed this influential and historical group and officially incorporated as the Professional Native Indian Artists Inc. (PNIAI) in February 1974. This “Group of Seven” was a groundbreaking cultural and political entity that self-organized to demand recognition as professional, contemporary artists. They challenged old constructs, and stimulated a new way of thinking about contemporary First Nations people, their lives, and art. The exhibition draws on both private and public art collections to bring together close to 100 works including recently uncovered masterworks of the period that have not been accessible to the public for many years. The exhibition focuses exclusively on that crucial decade during which the seven artists were active as a group, exemplifying the range and diversity of work being produced by the PNIAI in the 1970s. The exhibition considers their collective artistic impact, as well as the distinctive styles and experimentation of the individual artists. This is one of the key histories that signaled a new course for the exhibition and reception of contemporary Indigenous art. The visual impact of the works in this exhibition will reacquaint visitors with the excitement and newness of the images and styles which these seven artists produced. 7: Professional Native Indian Artists Inc. will be on display at the McMichael Canadian Art Collection from May 9 to September 7, 2015. It is organized by the MacKenzie Art Gallery and has been made possible through a contribution from the Museums Assistance Program, Department of Canadian Heritage. 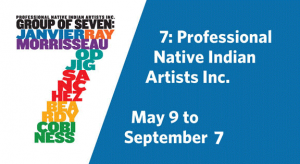 You are invited to a Media Preview for the remarkable exhibition, 7: Professional Native Indian Artists Inc. and meet artists Alex Janvier and Joseph Sanchez, and exhibition curator Michelle LaVallee. This event offers a unique opportunity to hear the experiences of Alex Janvier and Joseph Sanchez, two artists who were part of the seven-member, groundbreaking group Professional Native Indian Artists Inc. This self-organized group effectively demanded the recognition of Aboriginal artists as professional, contemporary artists. The conversation, led by curator Michelle LaVallee, will evolve around the collective artistic impact of the group, as well as the distinctive style and experimentation of individual artists. Fee: $29 general public; $24 McMichael members; $15 for students with valid ID. Fee includes gallery admission ($18 value). Registration required. Call 905.893.1121 ext. 2209, email bookings@mcmichael.com or visit mcmichael.com for more information.